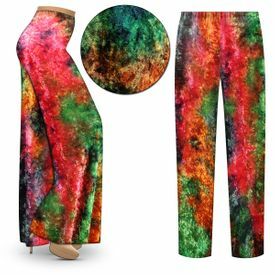 These are fabulous bright and vibrant lightweight stretchy crush velvet plus size elastic waist pants. They are available in straight leg, tapered, gaucho / wide leg palazzo pants, and come in either full or capri length. They boast the perfect print for fun & relaxation, and are completely customizable! This fabric is a wonderful lightweight crush velvet fabric (with lots of stretch) & a breeze to take care of! Throw it in the washer, dryer, and straight into a drawer or suitcase. They rarely wrinkle and travel great! They're very stretchy, and have a wonderful drape!